NEW YORK, Jan. 15, 2019 /PRNewswire/ -- S&P Dow Jones Indices and Experian released today data through December 2018 for the S&P/Experian Consumer Credit Default Indices. 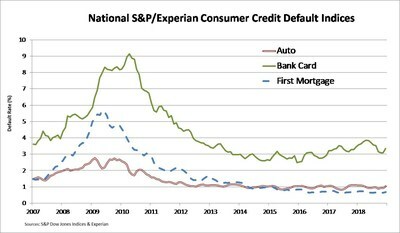 The indices represent a comprehensive measure of changes in consumer credit defaults and show that the composite rate rose six basis points from last month to 0.89%. The bank card default rate rose 25 basis points to 3.34%. The auto loan default rate increased ten basis points to 1.03%. The first mortgage default rate was three basis points higher at 0.67%. All five of the major MSAs showed higher default rates in December 2018. The rate for Miami increased 41 basis points to 1.93% while the rate for New York rose 13 basis points to 0.96%. The default rate for Chicago was up four basis points to 0.88%. The rate for Dallas increased three basis points to 0.85% while for Los Angeles, the rate increased two basis points to 0.52%. December 2018 marks the first time since January 2017 that all loan types and all major MSAs showed a higher default rate month-over-month. With one exception, index levels remain in line with or lower than levels one year ago. The Miami index is nearly twice its level of a year ago due to a sharp increase in the first mortgage component. "Consumer credit default rates are giving a caution signal," says David M. Blitzer, Managing Director and Chairman of the Index Committee at S&P Dow Jones Indices. "It has been almost two years since default rates across the three sectors and all five cities tracked in this report rose together. The chart shows that defaults on bank cards have resumed their uneven upward trend. A recent report from the New York Federal Reserve Bank notes that rejection rates on credit card applications rose in 2018 as did the number of times lenders cancelled accounts. These trends, combined with gradual increases in market interest rates during 2018, point to increasing pressure on the availability of consumer credit as the economy shifts from the fast path of growth last year to what analysts expect to be a slower, more sustainable pace in 2019. "The economic pictures behind the three lending sectors – autos, mortgages and bank cards – reveal different patterns. Housing is pressured by rising prices and higher mortgage rates. Sales of both new and existing homes are weakening. Auto sales were steady in 2017 and 2018 at slightly more than 17 million vehicles sold each year. Retail sales and consumer spending saw continued growth in 2018 with few signs that credit tightening was having any impact." The table below summarizes the December 2018 results for the S&P/Experian Credit Default Indices. These data are not seasonally adjusted and are not subject to revision. S&P Dow Jones Indices is a division of S&P Global (NYSE: SPGI), which provides essential intelligence for individuals, companies and governments to make decisions with confidence. For more information, visit www.spdji.com.